Feeling like one of these little guys right about now. Apologies, first off, to my readers for my prolonged absence. I could give you a laundry list of reasons why it’s been more than a month since my last blog post: things got busy, work’s been crazy, I’ve had writer’s block, I’ve been too busy watching Mad Men, etc. etc. But truthfully, I just haven’t been that inspired to write about food lately. Maybe I’m taking food for granted, or maybe I’m struggling with balancing my love of food with my ever-expanding waistline. So yeah. There it is. It’s taken something a bit drastic, however, to get me excited about food again. On Thursday, I had a wisdom tooth pulled. 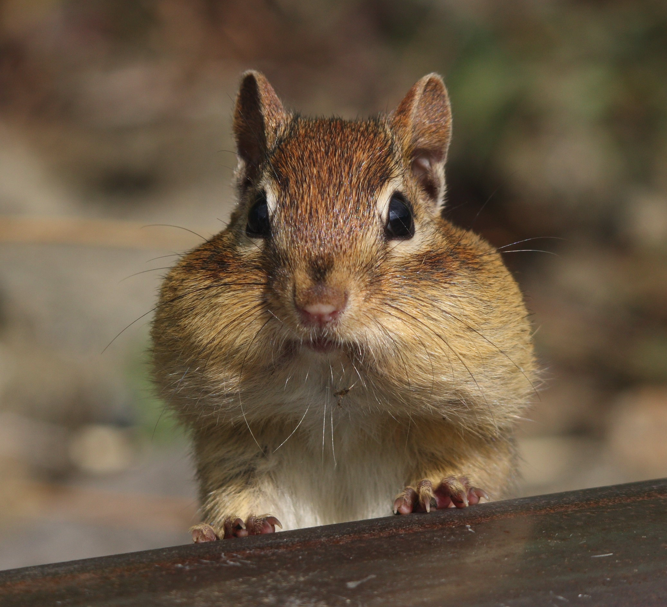 Having a wisdom tooth is no fun, for obvious reasons (hello, chipmunk cheeks!) but even more so when you’re going to be put under general anesthesia. You can’t eat anything for eight hours before the procedure, and afterward, you’re only supposed to have liquids, then soft foods. Which means you’re most likely doomed to eat nothing but mushy potatoes, smoothies, yogurt, pudding, apple sauce and tomato soups for three or four days straight. Planning ahead, I made a batch of vichyssoise, a potato-and-leek soup that’s supposed to be served cold, but after a couple of days, I got a little tired of it. My taste buds later turned to thoughts of Chinese food–especially congee, which is the ultimate comfort food–rice porridge with chicken, ginger, scallions. It’s easy to make, but it takes some planning ahead. Also, good luck trying to cook anything while doped up on painkillers. Hot stoves and Vicodin do not mix. I checked to see whether my favorite Chinese restaurant, Mark’s Duck House, had congee on the menu, but no dice. There was, however, crab meat and fish maw soup, as well as egg drop soup. Bingo. 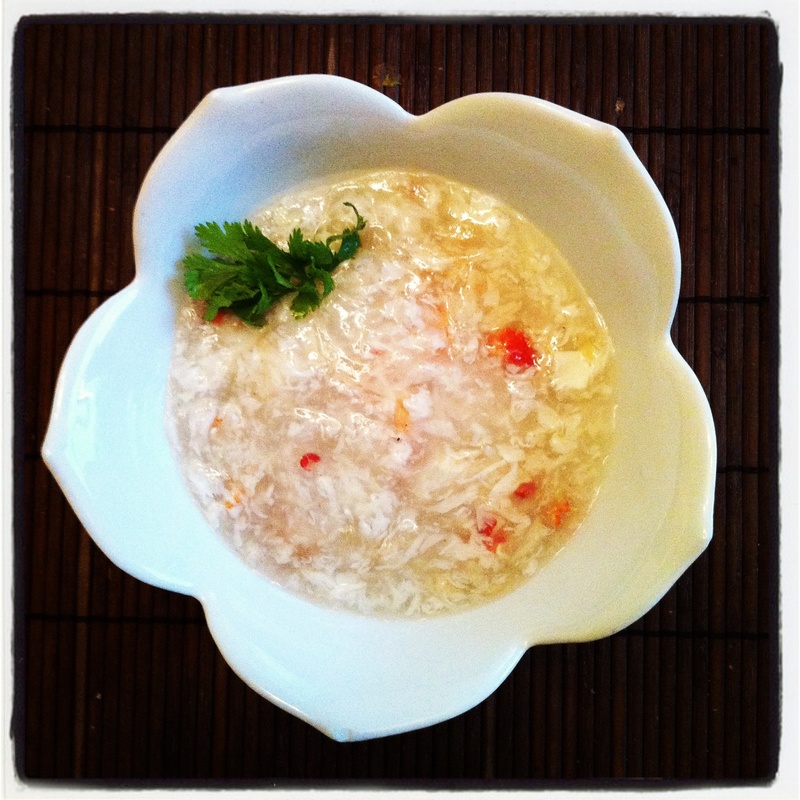 Egg drop soup is a pretty common staple on Chinese menus, but crab meat and fish maw soup is something special. It’s made with fresh crab (obviously) and fish “maw,” which is just a nice word for a fish’s swim bladder, the organ that gives fish the ability to control their buoyancy. It’s dried and reconstituted in soups, and has a texture similar to wet pork rinds. YUM! Did I have you at fish bladder and wet pork rinds? Why aren’t you salivating yet? Ok, so it’s not for everyone, especially those who are picky about textures, but to me, it’s delicious. Fish maw and crab meat soup is a rich, thick, hearty dish, perfect with a dash of white pepper and Chinese vinegar. It reminds me of shark fin soup, only without the unnecessary bloodshed and animal cruelty. Poor sharkies. What makes this soup, and egg flower soup, for that matter, great for a post-wisdom tooth extraction diet is that it’s chock full of protein and won’t leave your stomach grumbling in an hour, like mashed potatoes or tomato soup would. Also, I can’t seem to get enough of either soup. Can’t say the same for mashed potatoes or vichyssoise, for that matter. If you ever find yourself in a Hong Kong-style Chinese restaurant and happen to see crab and fish maw soup on the menu, give it a try, what the heck. And if you’re already a fan and would like to try DIY-ing this fabulous soup at home, try this recipe over at The Unoriginal Chef and let me know how it turns out. Now if you’ll excuse me, I’m going to fix myself a bowl of fish maw and crab soup, wash up, put a heating pad on my puffed out cheek, and think about what I want to eat–and blog about–tomorrow.